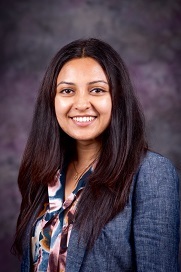 Soumia Bardhan, assistant professor of communication studies and director of global communication initiatives, has been elected the vice chair of the International Communication Division of the International Communication Association by its members. Bardhan will serve as vice chair for two years and then as chair until 2021. The association is the largest international academic association for communication and media scholars, with more than 4,300 members in more than 80 countries. As vice chair, Bardhan will employ her multicultural and regional experiences, international research and teaching expertise and international and interdisciplinary networks to facilitate the primary goal of her division — to promote exchange of knowledge among scholars studying communication across cultures and between or among nations, and help the division expand through collaborative endeavors involving scholars across the globe. As chair, she will serve on the International Communication Association's board of directors. Bardhan proposed to "foster the building of relationships between academic associations to nurture interdisciplinary, intercultural and international collaborations for research, teaching and service and drive our division in the direction of becoming an active community of colleagues and a dynamic platform for the diffusion of knowledge." "As assistant professor, this leadership post would be a strong recognition of Soumia's contribution to the field," said Tim Steffensmeier, head of the communication studies department. Read a full announcement of the association's 2016 election results online.